The AAU Girls Basketball Program offers opportunities for boys 1st—12th Grade, in all skill levels to participate in basketball. Events are held throughout the country, including, Invitationals, District Championships, Super Regionals', and National Championships. You must compete in your District Championship in order to participate in the National Championships. Events are conducted under the current AAU Code, AAU Girls Basketball Handbook and the competition rules of NFHS and NCAA as modified by AAU Girls Basketball. Events are conducted under the current AAU Code, AAU Girls Basketball Handbook and the competition rules of NFHS and NCAA as modified by AAU Girls Basketball. 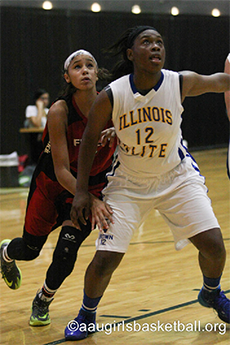 The AAU Girls Basketball program provides an avenue of competition for many grades in Division I, II & III competitions. For more specific details on rules and requirements please visit the website www.aaugirlsbasketball.org to review the handbook.